Today, I will give you an awesome Tapioca recipe which can be served as the main dish. This is an easy to prepare, tasty and cheap food. Hopefully most of you have taken it at your home at least in your childhood days. Even looking at the photo itself makes me remembering about my child hood days. It was a regular dish in my home at that time. 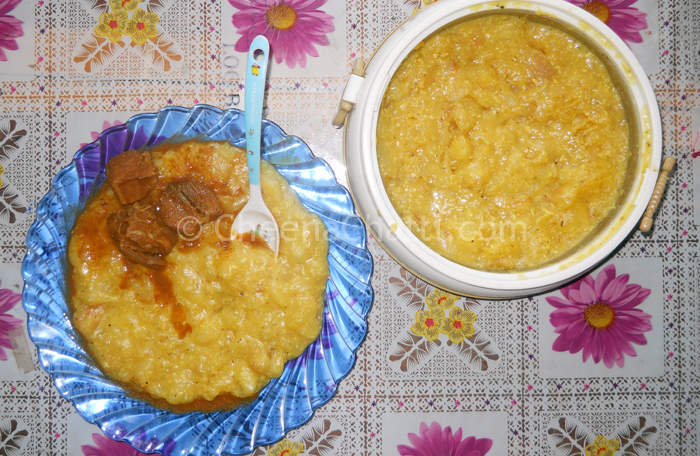 Try this awesome traditional Kerala recipe and let me know your comments. Clean and cut the tapioca into small pieces each of size around 1.5 inch and wash it thoroughly in water. Pressure cook the tapioca for 1 whistle time. Turn of the flame after its getting cooked, remove the water and keep it aside. Blend the coconut , green chillies, cumin seeds, curry leaves, shallots, garlic and turmeric powder lightly in a mixer. Lower the flame, and open the cooker after its getting cooled. Mix it thoroughly into a semisolid format. Serve it hot along with Fish curry like Kerala style sardine curry. Like it? Dont forget to share your experience and thoughts. This entry was added on April 20th, 2013 by Renoos in Vegan and tagged with kerala style kappa, kappa thoran, kappa ularthiyath, kerala kuppa dish, tapioca curry, tapioca recipes, kappa meen curry, tapioca and fish, kerala breakfast. Last revised on April 4th, 2018. @Abdu: the consistency depends on how you blend it. If you dont want to make it semisolid, blend it lightly.